Sam Bass was born July 21, 1851 in Lawrence County, Indiana and died on his 27th birthday, July 21, 1878 in Round Rock, Texas He had lived a life that had made him famous to the point that he had become a folk hero to some. Sam had been orphaned at the age of 13 after which he began to live with an uncle who was stern and strict with him. As soon as he could, young Bass left his uncle and relocated to Rosedale, Mississippi where he worked for about a year in a saw mill. In the summer of 1870, he set out for Texas, traveling with a family named Mayes who were returning to their home in Denton County, Texas. He had heard about Texas and the cowboy life and wanted to try it. After working for a time on a cattle ranch, he concluded that it was not as romantic a life as he had expected it to be. Bass moved back to Denton where after caring for horses in the stable of a local hotel, he found a job working for Sheriff W. F. Egan who had a freight business that he ran in addition to serving as sheriff. Sam was a trusted employee there, but he began to become interested in the sport of match horse racing, acquiring an interest in a sorrel mare named Jenny. He was successful for a while and drifted down to San Antonio where he became friends with Joel Collins, who joined him racing Jenny. The next job he and Collins were known to have was putting together a herd of cattle for a trail drive to Deadwood, South Dakota. After the drive, instead of returning to Texas to pay for their cattle, Bass and his friend remained in South Dakota for a while and worked again in a freight business, until it is thought that he and his associates were suspected to have participated in some small robberies, once only netting a dozen peaches. On September 18, 1977, he and his associates held up a Union Pacific train at Big Springs, Nebraska, taking away $60,000 in newly minted $20 gold pieces. They were pursued by a posse including a detatchment of cavalry resulting in the deaths of his friend Collins and another associate named Heffridge. A third bandit, Jim Berry, later died of his wounds, but Bass escaped and returned to North Texas where he set about to rebuild his gang. In the months that followed, Bass recruited others for his gang and continued doing holdups in the area, attracting the attention of local authorities. 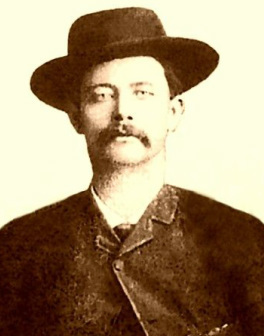 A contingent of Texas Rangers including John B. Jones, Junius Peak and local authorities, including Bass’ old employer Sheriff Egan were assigned to try and capture the bandits. Several of the outlaws were killed or captured, including Jim Murphy. Murphy was released in a deal that allowed him to rejoin the gang on the condition that he serve as an informant for the gang’s future activities. Murphy later sent word that they were planning on holding up The Williamson County Bank at Round Rock on a particular date. The Rangers and other lawmen made plans to intercept the gang. When the day arrived and the gang came to town, a gun battle ensued after Deputy Sheriff Grimes spotted them and attempted to question them. Grimes was shot and killed after which three rangers named Connor, Herold and Ware joined the battle. Ware killed the bandit Seaborn Barnes and both Ware and Herold shot and seriously wounded Bass, though he was picked up by an associate named Frank Jackson and they both fled. Bass knew he was mortally wounded and persuaded Jackson to leave him outside of town and continue on to safety, which Jackson did. The next day, July 21, 1878, Williamson County Deputy James Milton Tucker found Bass lying under a live oak tree. He was transported back to town, where he later died and was buried in Round Rock Cemetery in Williamson County, Texas. Bass’ legend would continue to grow following his death and he would be considered something of a Robin Hood-type hero. Tales were told of his generosity with his stolen loot, adding to the legend. Stories, poems and songs would follow, including the 1930s song lyrics below, attributed to John Benton. Rode into town of Denton with all his friends to share. But I can tell you his racket-he’s a deadbeat on the sly. ‘Twas only a plan to capture Sam before the coming fall. And Jackson’s in the bushes trying to get away. Oh, what a scorching Jim will get when Gabriel blows his horn! But if I’m right in my surmise he’s gone the other way. Sam Bass history is really amusing, while here is a good photo, his images are rare,the Eagle Ford robbery was a loss, in the sense not much came up, I can recall seeing the Rail Road file in Austin some years ago…..and Denton Texas was a good place for him to hide out…..over all the folk lore that has come about, the 20th Century was his home……really was….